Do you have thick skin, a sense of humor and love of adventure? If so, you'll love me. I'm a wild man! I'm very active, a bit hyper and like to keep you on your toes by trying to bite you when you aren't looking. Or maybe you are looking. I really don't care. It's fun. I have a lot of energy and need to have a lot of room to run, play and get out my ya-yas and pent up energy. I'm not the right man for the faint of heart or hanging around kids. My perfect home is with an experienced bunny guardian who doesn't take things personally and gets a kick out of spirited bunnies. 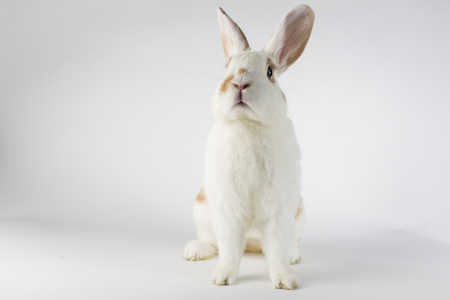 I am the type of smart, busy bunny who would really respond to clicker training and enjoy being given a project to keep me busy. I know I am a handful and more, but then again, who wants to live a boring, uneventful life?